Again, this is a recipe created by poking around the frig this morning to find what is hanging out in the nooks and crannies, still left from the big influx of food before Thanksgiving or already in our freezer/pantry ready to use. I want to make sure that all the veggies that came with our Tantre Farm Thanksgiving CSA share get used for something delicious to eat, not "worm food" (yes, my husband has a vermiculture tub - i.e. worm composting - in the basement) or outside in our compost pile. 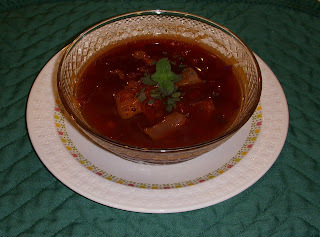 We frequently eat a supper of a hearty home-made soup, salad, and whole grain bread. Tonight I made this filling, delicious, beautiful, and healthy red cabbage soup, which we relished and ate with the remaining kale balls and bruschetta/pepper sauce, along with whole wheat bread. In addition, my husband thought it appropriate that we had a glass of red wine with our red soup. Yum, yum, yum! We finished our meal with the small pieces of chocolate that came in the Michigan Lady Food Bloggers' stocking at our cookie exchange last night. Thanks, Patti! * chopped fresh green herbs for garnish (I was inspired by one of my favorite blogs, Dandelion Haven.) I did not use the rosemary in my south-facing kitchen window but tried the spicy marjoram I brought in the for winter for a less intense but still flavorful and colorful garnish on top of the soup. 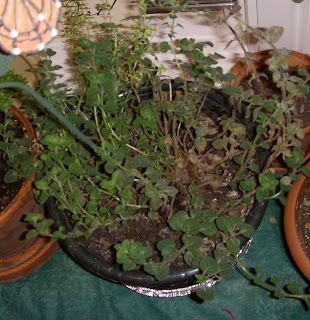 I purchased this marjoram plant at the Farmers' Market in Plymouth, MI on an outing with some of my dietitian friends, so I enjoy nurturing it each day as a reminder of those great friends. 1. In a large soup pot, combine the water, broth, tomatoes, tomato paste, chopped potato, bay leaf, salt, and seaonings. Simmer for 30 minutes to 1 hour. Add the cabbage, beans or lentils. Heat just until cabbage is slightly wilted but still a bit crunchy and also until beans are heated through and/or lentils are cooked. Remove the bay leaf, top with a garnish, and serve. Looks and tastes great topped with the cut fresh herbs, some unflavored yogurt or a sprinkle of baked and chopped pumpkin or squash seeds. Soup fanatic here.. I love searching around the net just to get more idea in preparing a best soup for my family.